Maharajas Express has a capacity of 88 passengers in elegantly appointed cabins which include a lavish presidential suite spanning over an entire carriage. Maharaja Express Indian Train, is owned and operated by “Indian Railway Catering and Tourism Corporation” and is the most expensive luxury train in the world. It runs on 5 circuits covering more than 12 destinations across North-West and Central India, mainly centered on Rajasthan between the months of October to April. Maharaja Express is most luxurious train in India with initially having 23 coaches. The Maharajas’ Express different itineraries cover destinations like – Delhi, Jaipur, Ranthambore, Fatehpur Sikri, Agra, Gwalior, Khajuraho, Varanasi, Lucknow, Mumbai, Ajanta, Udaipur, Jodhpur, Bikaner & Balasinor. The Safari bar is well-stocked with the most exclusive collection of house brands of beers, wine and spirits, which all come complimentary. The train also has a lounge called the Rajah Club with a private bar, two dining cars and a dedicated bar car. Equipped with games tables, club arm chair, a comprehensive collection of books, and choicest of the wines and spirits, Rajah Club is the best place on the train to unwind, relax, rejuvenate and engage in a leisurely conversation with fellow-travelers. There are four categories of cabins/Suites in this Luxury train. 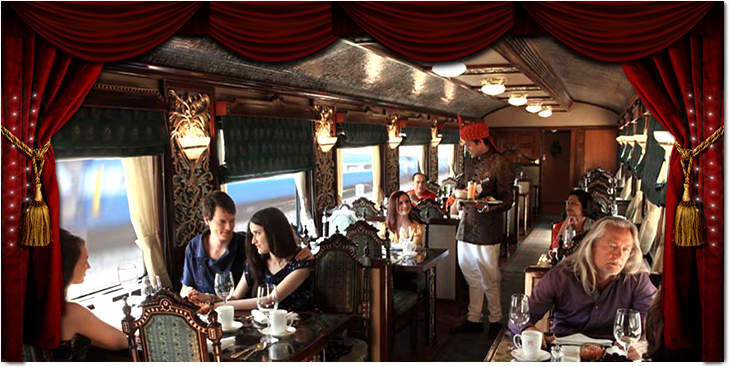 The Cabins on the Maharajas’ Express are the most Lavish among all the International Luxury Tourist Trains. The Lavish Interiors, distinct theme supplemented by the latest International safety features such as Electronic smoke detection system, CCTV, Pneumatic suspension for superior ride comfort will ensure your Luxury rail journey a truly comfortable experience you ever had. The state of the art facilities in all the cabins of the train includes Live Television, Wi-fi Internet, Direct Dial International Telephone Facility, DVD player, LCD screen, wardrobe, Personal safe and cabin controlled air conditioning and en-suite bathroom facilities such as shower cubicle with running hot & cold water, W.C and basin. To make your stay Lavish and relaxed, we provide amenities such as bathrobe, slippers, hairdryer, range of Luxury toiletries made of essential oils. Each car of the train is attended by personalized valets to provide you with attentive, friendly and un-intrusive service throughout your Luxury rail tour. The high ratio of staff to guests in the train ensures prompt services, should you need any assistance during the rail journey or during off-board excursions. No wonder these Lavish and unique features of this Luxury train has enhanced the comfort levels of the guests and aided Maharajas’ Express to receive the internationally acclaimed World’s Leading Luxury Train Award. To ensure your safety and well-being, the train has been provided with CCTV cameras, smoke alarms, RFID door locks and round the clock services of a Paramedic. 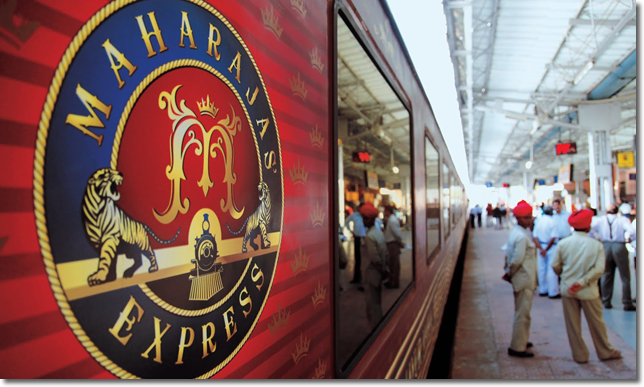 Your tour package on-board the Maharajas’ Express will be truly an experience extraordinaire. The train coaches of Deluxe Cabin are named after the precious gems Hakik(Agate), Firoza(Torquoise), Katela(Amethyst), Beruz(Aquamarine) & Pitoniya(Bloodstone) to indicate the lavishness present in the overall experience provided in the tour Packages of Maharajas’ Express. The train has 20 Deluxe Cabins of which 12 are twin bedded and 8 double bedded. A train almost half a mile long redefines luxury and comfort. It recreates the lifestyle of a princely era and provides an experience of lavish living. The Train that never falls short of royal experience provides various categories of cabins, one among them being the Junior suite. The train coaches of Junior suites are named after the precious gems Moti(Pearl), Panna(Emerald), Manik(Ruby), Gomed(Hessonite), Moonga(Coral) & Pukhraj(Sapphire) an indicator of lavish present in the overall experience provided in the tour Packages of Maharajas’ Express. The train has 18 Junior suites of which 12 are twin bedded and 6 double bedded. All the suites have large panoramic windows, so that you can savour every bit of magnificent India on your train journey. All passenger carriages come with individual temperature controls, the first of its kind in India and have state-of-the-art facilities like Live Television, DVD players, Wi-Fi Internet to name a few to keep you entertained through the royal train journey. Each coach of the train has a mini-pantry and manned by a valet to provide a lavish & personalized service during the tour packages. The suite room on rail is luxury redefined at 220 Sq. ft area. The rail coaches of Suites are named after the precious gems Heera(Diamond) & Neelam(Blue Sapphire) to indicate the luxury and splendours offered on-board . All the 4 suites are double bedded and have large panoramic windows, so that you can savour every bit of Indian splendour on your rail journey. Each coach of the rail has a mini-pantry and manned by a valet to provide with attentive & prompt service. The Presidential suite is aptly named Navratana(nine precious gems) and has a living room, 2 bedrooms and washrooms. The guests on-board the Presidential suite has an exclusive 24 hours personal valet to provide with attentive and luxury service. This palace on wheels has been provided with latest international features. The exciting Gems of India tour combines enthralling explorations with boundless luxury. Duration – The tour stretches up to four days and each day brings a new city to explore. Fare- The fare for gems of India route starts from $3850 and for interesting offers, you can click here. Season- The season for this unique Gems of India journey starts in October and ends in April. You can always choose to either end or start a year with us amidst luxury and opulence. 22:00 hours Assemble at the railway station at least an hour before the actual departure time to complete check-in and registration formalities. The train leaves Delhi at around 2200 hours and proceeds towards its first destination Agra. Dinner is served on board. The guests have the choice of enjoying their meals at any of these two beautifully crafted restaurants – the Rang Mahal and the Mayur Mahal. Overnight stay on Maharajas’ Express. Visit Fatehpur Sikri – the fortified Mughal city that was the capital of the Mughal empire from 1571 and 1585. Visit Itmad-ud-Daula – a Mughal mausoleum often regarded as a draft of the Taj Mahal. A rejuvenating spa at a 5 star hotel. Private shopping tour for pietra dura marble and fine Mughal Jewellery. Enjoy spa facilities at a palace hotel. Golfing at the Rambagh Golf Club. Visit to City Palace and Jantar Mantar (the stone observatory). Shop around the city for some of the finest jewelry, fabrics and handicrafts that Jaipur is famous for. An exciting Exhibition Elephant Ride at A Jai Mahal Palace awaits you during the latter half of the day. You may also choose to participate in the exhibition game, which is followed by a Champagne dinner An exciting Exhibition Elephant Ride at A Jai Mahal Palace awaits you during the latter half of the day. You may also choose to participate in the exhibition game, which is followed by a Champagne dinner at the hotel. Board the train to continue your journey to Delhi. Day Schedule Breakfast on board. 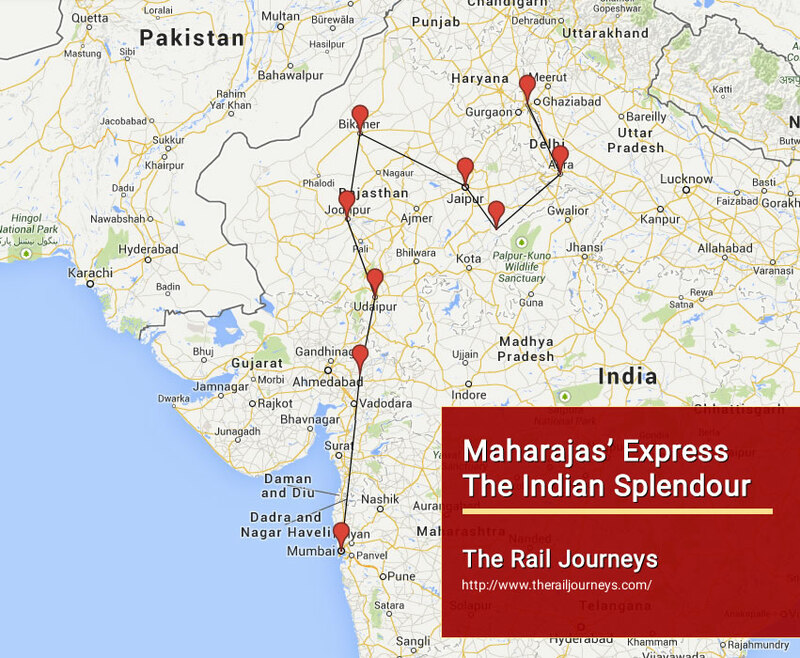 Bid farewell to the Maharajas’ Express. 14:30 hours Assemble at the hotel for a warm traditional welcome and complete your registration and check in formalities. 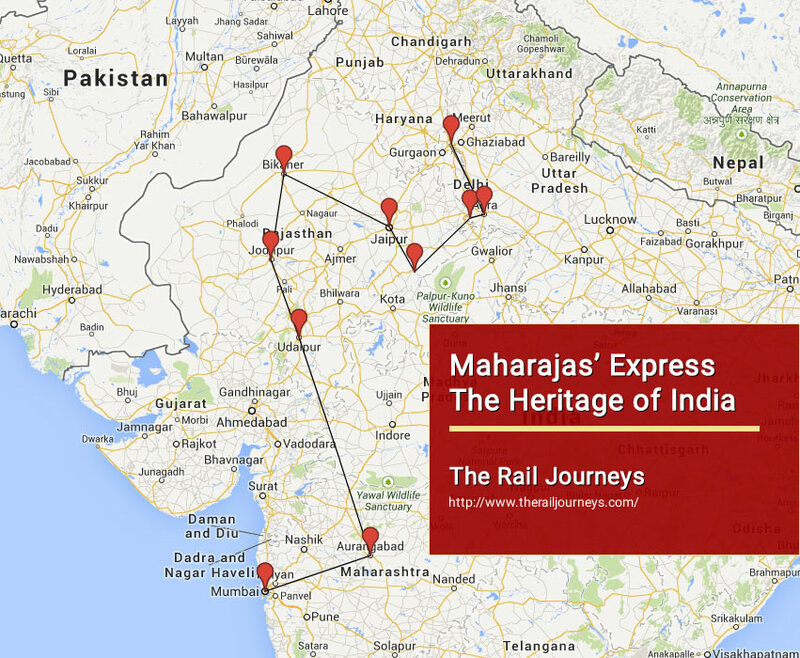 The Maharajas’ Express starts from Mumbai at 1640 hours and will travel through the land of the Marathas. Dinner and overnight stay onboard the train. Day Summary Enjoy a lavish breakfast on board and visit the astonishing rock-cut caves of Ajanta. A protected monument under the Archaeological Survey of India and listed in the World Heritage list of monuments; the caves of Ajanta were created over a span of some 600 years. The Ajanta Caves are a series of 29 Buddhist cave temples, some of which date from the 2nd century BC. Encompassing both Theravada and Mahayana Buddhist traditions, the caves preserve some of the best masterpieces of Buddhist art in India. Return onboard and the train rolls towards Udaipur. Breakfast, lunch & dinner are served on onboard the two skillfully designed restaurants – The Rang Mahal and the Mayur Mahal. Retire to your cabins or have a drink at the Safar bar or the Rajah club. Return to the train to enjoy a relaxed afternoon. Pamper yourself with a rejuvenating spa in a five star hotel. Visit the Vintage & Classic Car collection – showcasing the magnificent Rolls-Royce, 1939 Cadillac open convertibles, rare Mercedes models, 1936 Vauxhall and 1937 Opel models. Day Summary To let you listen to the tales of antiquity in the emptiness of the dessert, the train enters the fortress city Jodhpur. The guests have the freedom to either stay on get a glimpse of true Rajasthani village life via the Bishoni Village Safari – where you can spot wild life like black bucks, chinkara, blue bulls, desert foxes, and partridges and can also have an opportunity to see the Bishoni families. Peep into their world and see the weavers, potters and block printers at work. If you prefer, you may go for a spa at a five star hotel in Jodhpur. Post lunch on board, get ready to witness the magnificent forts, palaces and some of the finest architectural wonders of the world in the city of Jodhpur. The excursion starts with a walk through the Old Clock Tower market and proceeds on to the prime attraction in the city – the Mehrangarh Fort. The 5 km long majestic fort on 125 m high hill has some magnificent palaces with marvelously carved panels, latticed windows and evocative names within its complex. Noteworthy of these are the Moti Mahal, the Phool Mahal, the Sheesh Mahal, the Sileh Khana and the Daulat Khana. These palaces have a fabulous collection of palanquins, elephant howdahs, and miniature paintings of various schools, musical instruments, costumes and furniture. 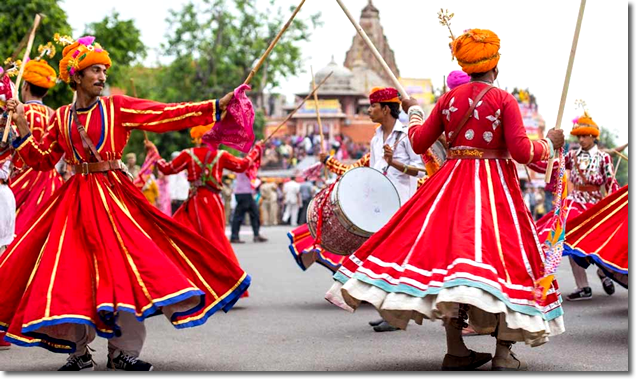 Enjoy the colorful folk dances of Rajasthan at Hanwant Mahal, where a cocktail dinner is organized. Return to the train as the train rolls towards Bikaner – renowned for the best riding camels in the world. Explore the imposing red sand-stone palace – the Lalgarh palace, which stands as a hybrid architecture and mixture of different elements of Rajput, Muslim and European styles. The Rajput exterior of Lalgarh Palace contrasts dramatically with the occidental d?cor within. Lush green sprawling lawns with dancing peacocks and beautiful bougainvilleas adorn the palace. Visit the astonishing Karni Mata Mandir or the Rat temple in Deshnoke, 30 km from Bikaner. The temple has thousands of rats that live, and are revered in, the temple. Eating food that has been nibbled on by the rats is considered to be highly auspicious. Post lunch, which is served onboard Maharajas’ Express, visit the Junagarh fort that dates back to 1588 A.D. built by Raja Rai Singh, the fort is a formidable structure encircled by a moat and has some beautiful palaces within. These palaces, built in red sandstone and marble, make a picturesque ensemble of courtyards, balconies, kiosks and windows. Immerse yourself in the true colors of the dessert with a Camel cart procession, which is followed by sundowner cocktails, barbecue and Rajasthani folk performances on the sand dunes. Board the train for dinner and overnight stay. The train proceeds towards to make you witness sheer symphony in pink in Jaipur. Take one of the optional tours. Have a revitalizing spa at a five star hotel in Jaipur. Enjoy Golfing at the Rambagh Golf Club – a 18 hole, 6303 yard, Par 70 layout that is beautifully laid out & centrally located. Visit the City Palace – the former royal residence; and Jantar Mantar – a stone observatory. Dinner and overnight stay on board the royal train. Day Summary Even before the sun dawns, you reach Sawai Madhopur, home to the Ranthambore National Park. A thrilling safari takes you close to the abode of the national animal of India – the Tiger. The park is home to other wildlife as well including sambar, chital, nilgai, chinkara, wild boar, sloth bear, hyena, jackal and leopards. After experiencing the exhilarating expedition, have a lavish breakfast at Vivanta by Taj – Sawai Madhopur Lodge. During the latter half of the day, the train takes you across the fabled magnificent fortified Mughal city Fatehpur Sikri – a UNESCO World Heritage Site. Admire the changing landscape while enjoying a hearty lunch on board. Brace yourself with the Mughal history by visiting this complex of monuments and temples, all in a uniform architectural style, including one of the largest mosques in India – the Jama Masjid. Other prime attractions here include Palace of Jodha Bai, Bibal Bhavan, Karwan Serai & Hiran Minar, Panch Mahal, Diwan-i-Khas and Diwan-i-Am. Return to the train to enjoy the flavours of an ‘India Night’ as the train continues its journey towards Agra. Day 8 Saturday Agra and New Delhi. 14:30 hours On the last day of what can be termed as a truly magical tour, you arrive into Agra city. The city homes the most extravagant monument ever built for love – Taj Mahal. This poignant mausoleum has become the de facto tourist emblem of India. It was constructed by Emperor Shah Jahan in the memory if his beloved wife, Mumtaz Mahal, whose death in childbirth in 1631 left the emperor heartbroken. The construction of the Taj began in that year and continued till 1653. Over 20,000 workers from India and Central Asia are believed to have created this marvel. No wonder, the result is so breath taking and awe-inspiring The Taj Mahal stands on a raised marble platform, north of the ornamental gardens. Purely decorated white minarets grace each corner of the platform. Twin red sandstone buildings frame the Taj; the western one is a mosque, the identical eastern one is purely for symmetry. The central Taj structure has four small domes. The tombs of Mumtaz Mahal and Shah Jahan are in a basement room. The visit to this amazingly beautiful monument is followed by Champagne breakfast at Hotel Taj Khema, which overlooks Taj Mahal. Return to the train and enjoy your lunch on board in any of the exquisite restaurants – The Mayur Mahal or the Rang Mahal. Soon, your journey into the lap of Indian heritage would conclude as you train reaches the Safdarjung Station in New Delhi. 22:00 hours Assemble at Safdarjung station at 2030 hours and complete your registration and check in formalities. 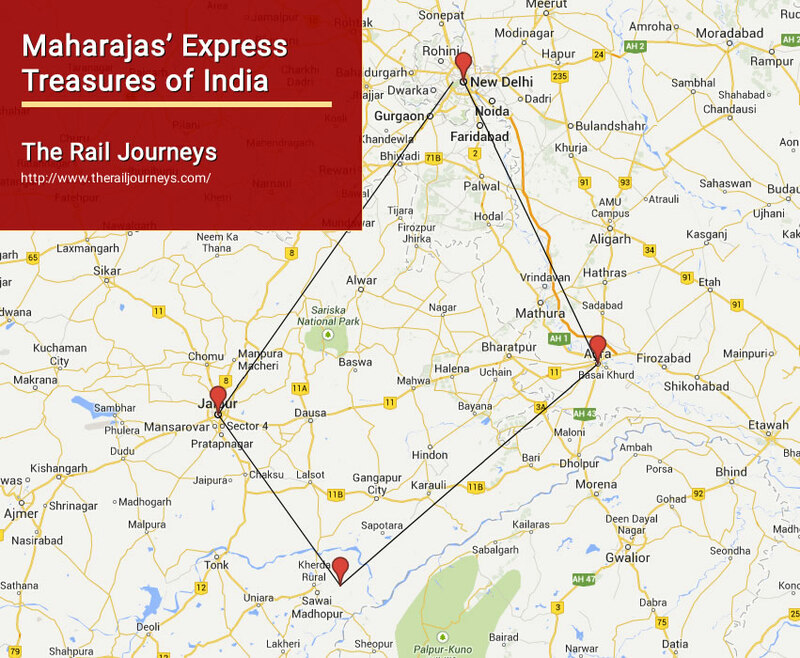 The Maharajas’ Express departs from Delhi at 2200 hours to Jaipur. Dinner and overnight stay on board. Dinner and overnight stay on board the royal train. The train progresses its journey towards Sawai Madhopur in Southern Rajasthan. Day 3 Monday Ranthambore and Fatehpur Sikri. Even before the sun dawns, you reach Sawai Madhopur, home to the Ranthambore National Park. 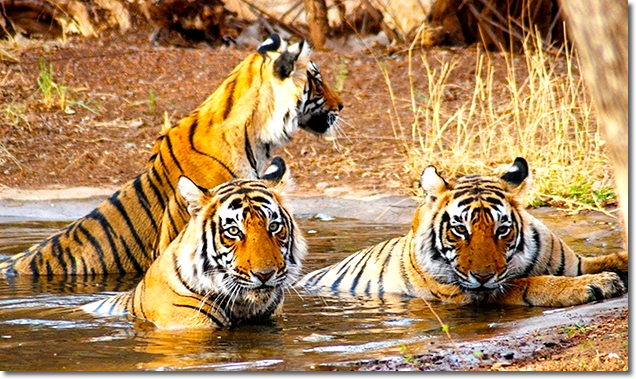 A thrilling safari takes you close to the abode of the national animal of India – the Tiger. The park is home to other wildlife as well including sambar, chital, nilgai, chinkara, wild boar, sloth bear, hyena, jackal and leopards. After experiencing the exhilarating expedition, have a lavish breakfast at Vivanta by Taj – Sawai Madhopur Lodge. During the latter half of the day, the train takes you across the fabled magnificent fortified Mughal city Fatehpur Sikri – a UNESCO World Heritage Site. Admire the changing landscape while enjoying a hearty lunch on board. Brace yourself with the Mughal history by visiting this complex of monuments and temples, all in a uniform architectural style, including one of the largest mosques in India – the Jama Masjid. Other prime attractions here include Palace of Jodha Bai, Bibal Bhavan, Karwan Serai & Hiran Minar, Panch Mahal, Diwan-i-Khas and Diwan-i-Am. Return to the train to enjoy the flavours of an ‘India Night’ as the train continues its journey towards Agra. Day Schedule Early morning, your train reaches Agra – the city that homes the most extravagant monument ever built for love – Taj Mahal. This poignant mausoleum has become the de facto tourist emblem of India. It was constructed by Emperor Shah Jahan in the memory if his beloved wife, Mumtaz Mahal, whose death in childbirth in 1631 left the emperor heartbroken. The construction of the Taj began in that year and continued till 1653. Over 20,000 workers from India and Central Asia are believed to have created this marvel. No wonder, the result is so breathtaking and awe-inspiring. The visit to this amazingly beautiful monument is followed by Champagne breakfast at Hotel Taj Khema, which overlooks Taj Mahal. Return to the train and continue your journey towards Gwalior – the tourist capital of Madhya Pradesh. As you reach Gwalior, enjoy a royal welcome and lunch at the 120-year-old palace – Usha Kiran, now turned into a heritage hotel. Post this, visit the Gwalior fort – steeped in the splendor of its past. Built by Raja Man Singh, the fort dominates the city like a great monolith. It is one of the finest citadels of India. Emperor Barbur described it as ‘the pearl amongst the fortress of Hind.” Return to the main city to visit the Jai Vilas Palace Museum, which exhibits a collection of antiques belonging to the Scindia reign. Enjoy Hi tea at the palace compound. Return to the train for dinner and overnight stay as the train rolls towards its next destination Orchha. Day Schedule As the train reaches Jhansi railway station, you will embark on an excursion to Orcha, some 15 km away from the station. Visit the Jehangir Mahal, a tiered palace crowned by graceful chhatris. Stroll through Chaturbhuj Palace and the Cenotaphs of Orcha rulers along the shores of Betwa River. Return to the train as it progresses towards the World Heritage site – Khajuraho. The temples of Khajuraho are India’s unique gift to the world, representing a paean of life, to love and to joy; perfect in execution and sublime in expression. Life, in every form and mood, has been captured here in stone testifying to the craftsman’s artistry and the extraordinary breadth of vision of the Chandela Rajputs. Post this sightseeing excursion to the spectacularly mounted temples, you may go for a spa at a 5 star hotel. All optional tours are chargeable. Enjoy your dinner and overnight stay on board. Day Schedule As the dawn breaks and the train arrives to Varanasi – the city of Hindu God Shiva, located on the banks of the sacred Ganges. 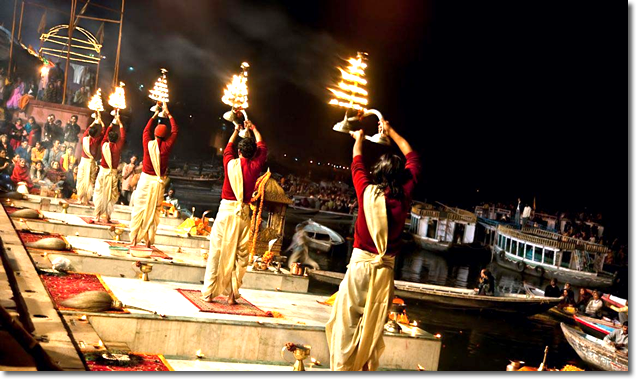 Varanasi, also known as Benaras and Kashi is one of the oldest living cities in the world. Its Prominence in Hindu mythology is immense. In Mark Twain’s words, “Benaras is older than history, older than tradition, older even than legend and looks twice as old as all of them put together.” Post breakfast; embark on a tour to Sarnath ruins followed by a visit to the Sarnath Museum. All of the ancient buildings and structures at Sarnath were damaged or destroyed by the Turks. However, amongst the ruins the Dharmekh Stupa is impressive at 128 feet high, and 93 in diameters. This dates from around 200 BC and is the spot where the Buddha is said to have preached his first sermon. Lunch is served on board Maharajas’ Express. After lunch, visit the Silk Weaving Centre. Varanasi abounds in the art of silk weaving, an exotic work of art which manifests itself in precious Banarasi Silk Sarees and Silk brocades which are cherished as collector’s items across the world today. 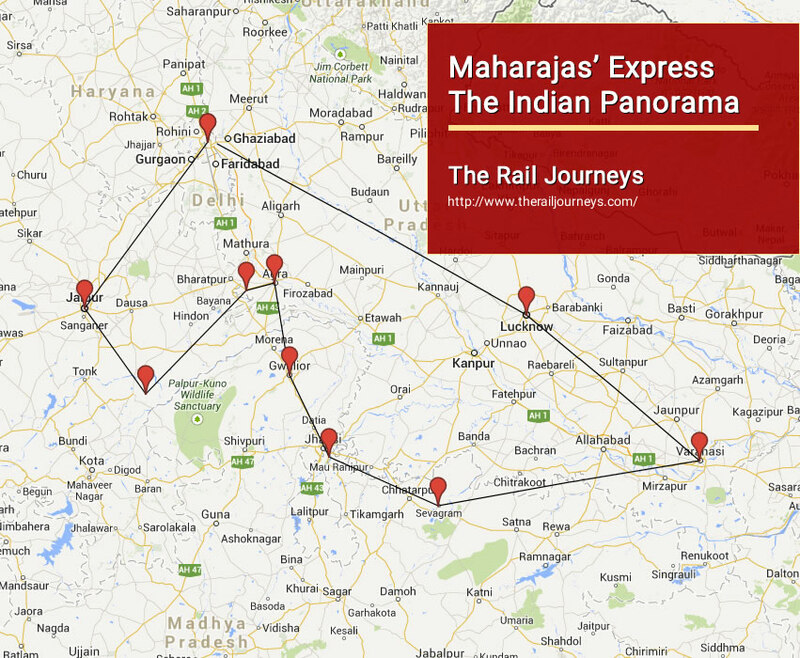 Board Maharajas’ Express to proceed towards Lucknow. Dinner will be served on the train itself. Day Schedule Your train reaches the city of Nawabs Lucknow early morning on the seventh day of your journey. Proceed on a sightseeing excursion of the city and pay a visit to Bara Imambara and The Residency. The Bara Imambara or Great Imambara was built in 1784 by Asaf-ud-Daula as a famine relief project. The central hall of the Imambara, 50 m long and 15 m high, is one of the largest galleries in the world. The Residency was built in 1800 for the British Resident, and this group of buildings became the stage for the most dramatic events of the 1857 Uprising – the Siege of Lucknow. The red-brick ruins are peaceful nowadays, surrounded by lawns and flowerbeds. Return on board for lunch and rest and get ready for an entertaining and fun-filled evening at the Residence of Local Nawab of Jehagirabad. Enjoy the world-renowned hospitality of Lucknow and relish the rich Mughlai cuisines and be a part of the ‘Indian Night’. Day 8 Saturday Delhi (Disembark). Day Schedule Post breakfast on board, bid farewell to the train and disembark. 22:00 hours Assemble at Safdarjung Railway station at 2030 hours and complete your registration and check in formalities for the Maharajas’ Express. After a traditional royal welcome, the train departs Delhi at approximately 2200 hours to Agra. Dinner and overnight stay on board. Return onboard as the train starts proceeding towards Ranthambore National Park, located in Sawai Madhopur in Rajasthan. Overnight on the Maharajas’ Express. Enjoy spa facilities at a palace hotel. Enjoy Golfing at the Rambagh Golf Club. Visit to City Palace and Jantar Mantar (the stone observatory). Shop around the city for some of the finest jewelry, fabrics and handicrafts that Jaipur is famous for. An exciting Exhibition Elephant Ride at A Jai Mahal Palace awaits you during the latter half of the day. You may also choose to participate in the exhibition game, which is followed by a Champagne dinner at the hotel. Board the train to continue your journey to Bikaner. Day Schedule As the train reaches Bikaner, the harbor of the ship of the dessert – the camel, you may relax on board or pick any of these excursions: Explore the imposing red sand-stone palace – the Lalgarh palace, which stands as a hybrid architecture and mixture of different elements of Rajput, Muslim and European styles. The Rajput exterior of Lalgarh Palace contrasts dramatically with the occidental decor within. Lush green sprawling lawns with dancing peacocks and beautiful bougainvilleas adorn the palace.Visit the astonishing Karni Mata Mandir or the Rat temple in Deshnoke, 30 km from Bikaner. The temple has thousands of rats that live, and are revered in, the temple. Eating food that has been nibbled on by the rats is considered to be highly auspicious.Post lunch, which is served onboard Maharajas’ Express, visit the Junagarh fort that dates back to 1588 A.D. built by Raja Rai Singh, the fort is a formidable structure encircled by a moat and has some beautiful palaces within. These palaces, built in red sandstone and marble, make a picturesque ensemble of courtyards, balconies, kiosks and windows. Immerse yourself in the true colors of the dessert with a Camel cart procession, which is followed by sundowner cocktails, barbecue and Rajasthani folk performances on the sand dunes. Board the train for dinner and overnight stay. The train proceeds towards the Marwar region – Jodhpur. Day Schedule To let you listen to the tales of antiquity in the emptiness of the dessert, the train enters the fortress city Jodhpur. The guests have the freedom to either stay on get a glimpse of true Rajasthani village life via the Bishoni Village Safari – where you can spot wild life like black bucks, chinkara, blue bulls, desert foxes, and partridges and can also have an opportunity to see the Bishoni families. Peep into their world and see the weavers, potters and block printers at work. If you prefer, you may go for a spa at a five star hotel in Jodhpur. Post lunch on board, get ready to witness the magnificent forts, palaces and some of the finest architectural wonders of the world in the city of Jodhpur. The excursion starts with a walk through the Old Clock Tower market and proceeds on to the prime attraction in the city – the Mehrangarh Fort. The 5 km long majestic fort on 125 m high hill has some magnificent palaces with marvelously carved panels, latticed windows and evocative names within its complex. Noteworthy of these are the Moti Mahal, the Phool Mahal, the Sheesh Mahal, the Sileh Khana and the Daulat Khana. These palaces have a fabulous collection of palanquins, elephant howdahs, and miniature paintings of various schools, musical instruments, costumes and furniture. 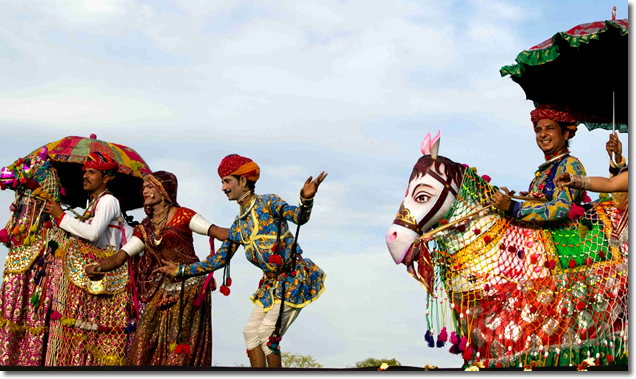 Enjoy the colorful folk dances of Rajasthan at Hanwant Mahal, where a cocktail dinner is organized. Return to the train as the train rolls towards Bikaner – renowned for the best riding camels in the world. Day Schedule As you reach Balasinor – a tiny town in Gujarat that is home to the one of the largest dinosaur fossils sites in the world, get ready for an exciting visit to the Dinosaur Fossil Park, one of the largest in the world. Famously known as the Jurassic Park of India, thousands of tourists travel to Balasinor for the see hundreds of fossils of Dinosaurs. At the site in Balasinor, tourists can see the skin, bones and real eggs of dinosaurs. But what makes Balasinor must travel destination is the fact that it is the only place in world where tourists can actually hold a 65 million years ago dinosaur eggs in their hand. Post this; enjoy a walkthrough the village and a lunch meeting with the Royal Family of the town. Return to the train as the train proceeds to Mumbai, where your trip would conclude. Later in the afternoon, proceed for a ‘Walking Tour’ through the Old Market of Udaipur, if you feel like. 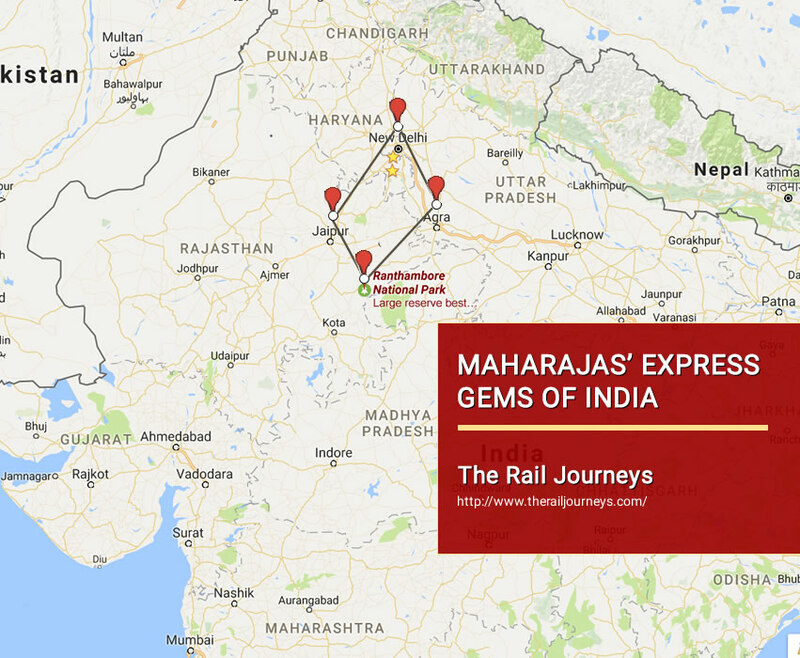 Return to the Maharajas’ Express as it starts rolling towards it next destination – Jodhpur. Dinner and overnight stay on board. Day 8 Saturday Mumbai (Disembark). Day Schedule Bid farewell to the train post breakfast on board. A rejuvenating spa at a five star hotel in Agra. Visit to Itmad-ud-daulah – a Mughal mausoleum often described as ‘jewel box’. It is also called the ‘Baby Taj’ and considered as a draft of the Taj Mahal. Day Schedule Early morning, get awe-struck by the beauty and majesty of the magnificent Taj Mahal. This giant white marble mausoleum is a UNESCO World Heritage Site. It took the efforts of over 20,000 craftsmen for over 20 years to create this wonder, often described as the greatest monument of love constructed ever in the history of mankind. Stroll through the ornamental gardens leading the way to the Taj and soak yourself in the symmetry, splendour and symphony that this monument exhibits. Board the train to continue your journey towards Ranthambore National Park, located in Sawai Madhopur in Rajasthan. As you savour your lunch, enjoy the beauty of the changing landscape from your window. As you arrive in Sawai Madhopur, get ready for an exhilarating jungle safari through the terrains of Ranthambore National Park. Consider yourself lucky if you spot the elusive tiger or a leopard. Nevertheless, you would witness other wildlife like sambar, chital, nilgai, chinkara, wild boar, sloth bear, hyena and jackal. Return to the train, enjoy a drink at one of the bars or relax at the lounge as the train keeps rolling, taking you nearer to your next destination – the vibrant Jaipur. Day Schedule Enjoy your breakfast on board and bid farewell to Maharajas’ Express as you reach Safdarjung Railway Station in New Delhi.